Our event ticketing & registration software includes everything you need to do a great job distributing your tickets online, whether you’re selling them or giving them away for free. EventNut’s ticket-creation tool is really flexible. Create as many different ticket types and price points as you need. Create a mix of free and paid tickets, if that’s what’s best for your event. Or, create a tiered system with promotional pricing and different on-sale dates. We offer an equally flexible ability to create coupons and promotional discounts. You can use EventNut to create any kind of ticketing and promotional structure you like. We do charge a small fee for selling your tickets online. The fee only applies when you’re selling your tickets. If you’re giving your tickets away for free, you can use our ticketing features for free, too. When our fee applies, we keep things simple: $1 plus 1%. Our fee is $1 per ticket sold, plus 1% of the ticket’s price. We also cap the fee for any one ticket at $10. If your event’s tickets are expensive to buy, you’ll appreciate our $10 cap. EventNut’s ticketing fees are among the lowest available anywhere. We make regular price comparisons with Eventbrite, among other companies. Comparing apples to apples, our ticketing fees are consistently only about half of theirs. There’s more about our ticketing fees in our event ticketing FAQ. 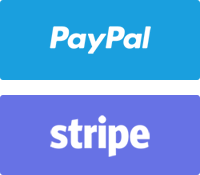 To handle the financial side of your ticketing transactions, we work with both PayPal and Stripe for payment processing. If you have an existing PayPal or Stripe account, you can use that account with EventNut. Or, it’s easy to set up a new account from directly within the EventNut app. A PayPal or Stripe account will allow you to accept credit cards or PayPal for your tickets. Depending on the processor you choose, you can access ticket revenue instantly. To learn more, check out our payment processing FAQ. EventNut registration forms are completely customizable. Different events have different data needs. Our custom registration forms allow you to collect the exact attendee data your event needs. You can ask attendees whatever you want. You can also choose how attendees respond (text, drop-down menu, etc. ), which helps make sure you can collect everything you need. There’s an automatic formatting feature that’s built into any registration form you create. This is helpful for making sure the phone numbers and email addresses you receive are in the right format, which helps your data to stay super-clean. When your registration form is ready, use our web publishing tools to get it up online. The process is a short one. You can be online, attracting prospects and converting new attendees, in well under an hour.